Thank you to everyone who has renewed their 2012 Dialogue Australasia Network Membership. We greatly value the support of our 350 member schools, organisations and individuals who share a committment to developing Values, Philosophy & Religious Studies in Australasia with intellectual rigour and contemporary relevance. or would like a copy of your 2012 invoice to faciliate payment. There is a great representation of teachers from Catholic & Independent schools registered for these workshops. It is not to late to be part of this valuable opportunity to reflect on the challenging and exciting area of Middle School RE (Yrs 7-10). This full day workshop with Dr Felicity McCutcheon (Head of Philosophy and Religious Studies at Melbourne Grammar School), will explore ways of making religious concepts accessible and meaningful to students. It will model units of work that are academically rigorous and existentially relevant to the deep concerns of our students, and provide opportunities for participants to develop units of work together. Further workshop information including details of venues can be found on the DAN website. Registered participants: Programme and venue details will be emailed to you by 19 March. Please note that registrations for June workshops in Tasmania 26/6, Canberra 27/6, Perth 29/6 close on 16 June. Member passwords to access teaching resources on the DAN website changed on 1 March 2012. New passwords are advised when your 2012 membership is renewed. If you do not know your password, or encounter any difficulties accessing resources, please contact the DAN EO. Every three months, the Australian Campfire Film Foundation rounds up new short films and showcases them in a Festival, with insights from subject matter experts. Check out past Festivals including: Living Together and Representations in the Media. The current Festival, THE GOOD LIFE, will be of particular interest to teachers of VCE Unit 3 Philosophy, and any teacher of secondary RE and Philosophy planning a unit around an examination of The Good Life. 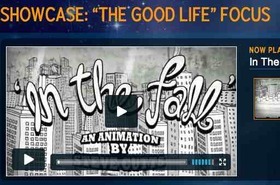 In this focused study of five short films, Dr Poulton provides a teaching unit to study the philosophy of the Good Life, exploring what it means to live well, with reference to Aristotle, Simone Weil and Nietzsche. Dr Poulton is the Education & Innovations Officer of VAPS, President of FAPSA and Secretary of ICPIC - three organisations that support Philosophy teachers. 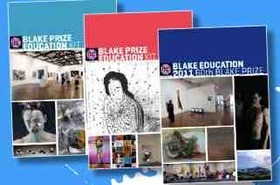 Part 1: An introduction to the Blake Prize and observations from history including the challenges and issues faced each decade and the changing nature of public debate around spiritual art. What is the place of religion and spirituality in Australian culture? Classroom activities, downloadable image files and research questions with references and bibliography have been written by the wonderful Dr Rod Pattendon (Chair, Blake Society). A key text for exploring this material is The Blake Book: Art, Religion and Spirituality in Australia, by Rosemary Crumlin. This 220 page volume, with 280 colour illustrations, provides a rich visual resource for exploring questions of belief and the religious imagination. The book explores Australian culture through the visual diversity of some of the finest artists of the last sixty years. (usually $69.95 + Postage). Download Order Form. 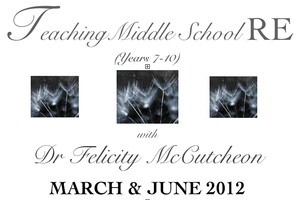 TACKLING TOUGH QUESTIONS - 1/2 price until 4 May 2012! We've showcased this great resource from RE Today before - and what better time to check it out than now, when it is 1/2 price. Tackling Tough Questions is aimed at secondary students and centres on an 85 minute DVD debate between two young people exploring the big questions of religion and philosophy on the subject of evil, suffering and death. The usefully segmented episodes are supported by a comprehensive book of classroom materials, discussion and lesson ideas. This is a most accessible, ready to use resource which your students will readily engage with. There is a reason we can't stop talking about the excellent film and teacher resources from EthicsOnline. Quite simply, it's because of their engaging, intelligent and balanced perspective on key ethical issues including Environmental Ethics, Sexual Ethics, War & Peace and Abortion. Check out a preview of each series, including a sample of the accompanying teacher's notes and classroom activities. DAN is proud to act as distributor for these films within Australasia. Click here for online ordering details. OPEN CULTURE: An amazing way to access 55 Philosophy Courses from the world's leading universities. Download audio and video courses to your computer or mp3 player. Another great (free!) web resource designed specifically for secondary students and teachers of Religous & Philosophical Studies. NEW RESOURCES from Video Education Australia. VEA advises they have 5 new programmes that will be of interest to secondary teachers of RE, Philosophy & Ethics. The DVDs include videos with comprehensive Teacher's Notes. Please order directly from VEA. Medical Ethics Series: IVF, Genetic Engineering, Euthanasia. The medical profession is uniquely placed to make decisions that can create, transform and sometimes even end other people's lives. Because of this, acquiring a strong framework of moral and scientific thinking is vital when dealing with the complex issues surrounding Euthanasia, IVF and Genetic Engineering. This series explores these three areas from the perspectives of practitioners, patients, families and religious and philosophical experts, using a wide range of interviews, real-world examples and opinions from around the world. The AHISA Pastoral Care Conference is an important professional learning opportunity for school leaders and other staff tasked with building community around values, and with the wellbeing of their students, including spiritual development. The Pastoral Care Conference is held biennially and is the only national conference dedicated to pastoral care in schools, addressing the needs of pastoral care staff across junior, middle and senior school levels. Various venues across New Zealand and Australia. Read more information….